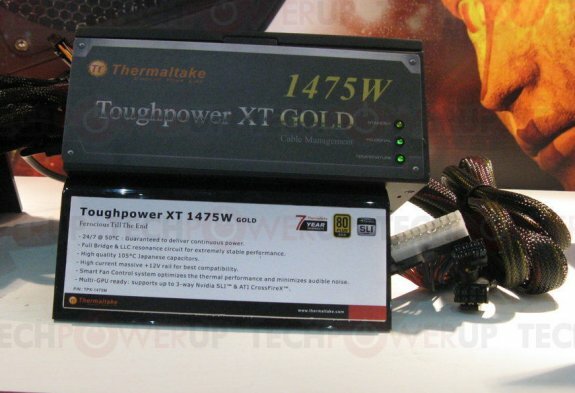 ThermalTake presented a Toughpower XT Gold 1475W power supply at Computex, it offers a single +12V rail and has an 80Plus Gold efficiency rating. Interestingly, this PSU will be backed by a 7-year warranty. Mind you, 1475W isn't its peak power, but continuous power guaranteed 24x7 @ 50°C. Further, the PSU uses a single massive 12V rail design to deliver that kind of power. The Toughpower XT GOLD 1475W is partially modular, with an angled 24-pin ATX connector and two 8-pin EPS connectors being fixed, and the rest let up for cable management.